Bionic eyes have been successfully implanted in two blind patients at Moorfields Eye Hospital in London. A video camera and transmitter are worn on a regular pair of glasses. An implanted artificial retina receives the electrical impulses from the Argus II camera and sends the moving images along the optic nerve to the brain. Although detailed images are not yet possible, the device can enable the patient to discriminate between rudimentary patters of motion, light and dark. Although bionic eyes are not to be found in the novel Cyborg, they were provided to Steve Austin in the television show made from the novel - The Six Million Dollar Man. 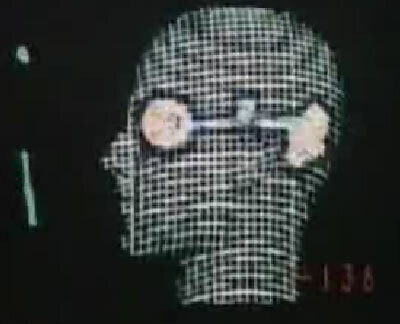 Take a look at the intro to the original TV show, including a brief view of the bionic eye diagram from The Six Million Dollar Man video. SF fans may also be reminded of the artificial eyes from Frank Herbert's Dune series - read about the Tleilaxu Eyes. Via Times Online. Thanks to Moira for the tip on this story.